There was much excitement around the School this week as the vibrant Music Department took delivery of a fantastic, top of the range, Yamaha grand piano. The School has many incredible pianists who will benefit from the new instrument. It will also feature in the many concerts run by the School every year. Over the past six months the School has been running a crowdfunding initiative to raise the £12,000 needed to buy the piano. The money was raised through donations from parents, friends and alumni of the School, the Parent Staff Association, local charity and generous donations from Thomson Reuters and Sir Tim Rice – a Richmond resident who officially opening our specialist music centre some years ago. The busy music calendar includes six informal concerts per year, a major concert every autumn, a primary schools jazz band tour and regular choral and orchestral concerts, as well as a range of other events. 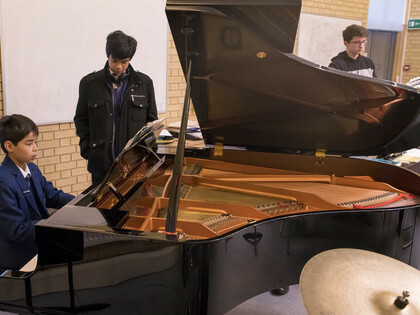 With a professional piano, the stage is also set to invite visiting performers to the School, enhancing the School’s links with the local community. In March 2019 the School will host the Nonesuch Orchestra, who will be rehearsing, playing and recording pieces written by our students and students from other local schools. In July the School will host a performance of the iconic Carmina Burana, conducted by our Director of Music, Philip Wilson where professional musicians will accompany Christ’s students in concerto performances.